Illuminated on the tray directly under Alan Mix's magnifying lens are what appear to be tiny piles of white sand. Magnified, that "sand" is revealed to be minuscule and perfectly formed spiral shells, microscopic fossils that are Mix's ticket back in time. "They look like dust particles, but there are entire worlds here," Mix said. 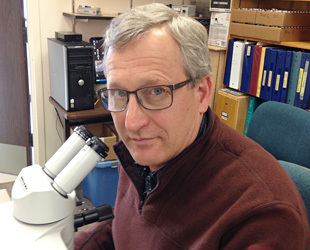 For the past four decades, Mix, an AAAS member and geochemist at Oregon State University, has studied paleoclimate, the climate of Earth's past. This has allowed him to glimpse how our planet's climate has shifted—often abruptly—and the mechanisms leading to these shifts. Ultimately, paleoclimate and what it reveals could provide a peek into our climate-changing future. In pursuit of past climate, Mix has traveled from the tip of South America to the North Atlantic to extract ancient mud found in sedimentary layers on the ocean floor. He and his fellow researchers have painstakingly separated the tiny info-packed remains of these organisms from the noise of their muddy capsules and categorized them one by one—a process that involves picking up each fossil, using a dab of water and a fine artist's paintbrush. Through a series of analyses, he and his team have revealed important snippets of past climates. "It's like assembling a humongous puzzle in multiple dimensions where you never have all the pieces," he explained. While the puzzle is still incomplete, an image of what Mix calls the "climate engine" is emerging. Like an internal combustion engine, Mix's climate engine runs largely on gas—the carbon dioxide (CO2) and other greenhouse gases in the atmosphere that trap heat, adding energy to the climate system. "The reason we study paleo[climate] is really to figure out processes. It's to figure out how the climate engine works. We are reverse-engineering this vast machine," Mix said. Written in the paleoclimate record is a clear pattern: During warm periods CO2 rises, and during cold periods it falls. This pattern is part of a larger, back-and-forth exchange of carbon and heat between the atmosphere, the ocean, and the land. One of Mix's major contributions to his field has been to show how ocean currents and the heat they carry connect to larger climate patterns. Starting in the 1970s, researchers began to examine how they might use microscopic fossils found in ocean sediment as a way to gauge past climates. One of the first methods they hit on had to do with distribution of organisms found in mud across the ocean as a way to measure water temperature. Different species have different thermal niches, that is temperature ranges in which they can survive. It made sense that if you knew a set of species' thermal niches and you knew where in the ocean they'd lived, then you could work backward and find temperatures. As a graduate student at Columbia University in the 1970s and early 1980s, Mix started to examine how to use species distribution and shell chemistry as proxies for climate in the tropical Atlantic. At the time, the ocean's past circulations were not well understood. Then Mix hit on an idea: He compared the fossilized remains of surface-dwelling plankton to bottom-dwelling organisms present in the same layer of mud. The surface-dwellers gave him information about surface water in the tropics; the bottom-dwellers, which were bathed in water that originated in the high latitudes, told him about the climate of the high latitudes. "In one sample you can see both the low latitude climate signals and the high latitude climate signals at precisely the same time," Mix said. Mix's results revealed massive transfers of heat between the Southern and Northern Hemispheres, which would be a key piece of his later research. This early work was also the start of a career made up of developing, honing, and comparing different ways to coax climate signals out of microfossils using a variety of proxy methods, and then using that data to understand larger climatic patterns and changes, changes that are often abrupt. In a 2014 paper in Science, Mix and Summer Praetorius, a former graduate student of his, demonstrated that 15,500 to 11,000 years ago, warming in the North Atlantic and North Pacific Oceans were linked to a larger climatic pattern that might have "tipped" the climate, ending the last ice age and ushering in our current, relatively stable climate. Climate tipping points, Mix says, are like cliffs: Once the climate falls off, it's hard to get back up. He suspects current human-caused climate change could be approaching just such a cliff as atmospheric CO2 rises higher than at any time in the last 800,000 years. In January of this year, Mix, along with his close colleague and lead author Peter Clark, was one of several authors of an op-ed in Nature Climate Change calling for politicians to start planning for sea level rise that could last as long as the next 10,000 years. Understanding the rates of glacier melt that's expected to fuel this rise is the subject of his current work. By comparing ice core samples from Greenland's Petermann Glacier to nearby sediment samples collected by him and his team from the ocean floor, Mix hopes to understand the factors involved in glacier melt. As for the current melting of the Petermann Glacier, he says, "This is one we're catching in the act."